Charging question about the Turbo! Hello all...hoping someone might be able to help me out. I got the Turbo last night and when I plug it in to charge, it recognizes the fast charger and charges super fast, however, I can't figure out how to give it a regular slower charge to make the batter last longer. I checked under battery settings but there is no option to turn off fast charging. I also have the Note 4 with the fast charging and there is an option to turn it on and off under the battery options. Just wondering if I am missing anything. Any help is greatly appreciated. Thanks! 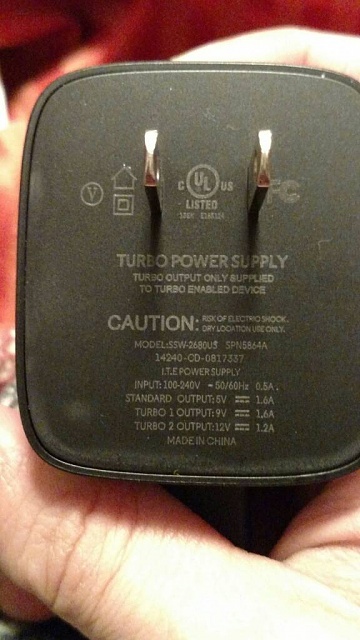 I believe the wall adapter itself is the turbo charger. If you use a spare adapter with the USB cord provided, you'll get your normal charge. I'm not sure if there's actually a way to disable the turbo charging, as it is native to the adapter itself. I'd be happy to be proven wrong, though! From all I've read, I don't think we can turn off the Turbo charging manually but it does slow to a normal charge once the battery gets to around 50% in the Turbo charger. It's safe to leave it on Turbo charger the whole time bc the circuitry is designed to protect the battery. Any thoughts on using the Turbo charging "block" with a wireless pad charging pad?? Don't think it will give Turbo charge through conductive external charge, may ruin your pad. Anybody else know more about this? I wouldn't use any power supply on a wireless charger other than the one that came with it. At what percentage does your phone need to be at for the Turbo feature to work? On the charger itself, it says it supports three different modes: standard 5v, Turbo #1 9v, and Turbo #2 12v. It would be cool if there was a way to switch to a slower charge based on command. Not certain, but I've heard between 0% & 50% from those that attended the launch in NY. They all say the lower it is the faster it charges til it gets to the switch point which may be around 50%? I'm one of those people who charges my phone every night while I'm sleeping. I did it with my Maxx and had zero issues during the entire year I had it. If I understand what you all are saying, the fast charging is not activated if the phone has less than 50% battery remaining when put on the charger. And if the phone has less than 50% remaining when you put it on the charger, then it will fast charge until 50%, but then slow to a normal charge. This would seen to make it safe to continue charging overnight using the Turbo charger that came in the box, is that correct? One relevant anecdote I noted yesterday was throwing the phone on the charger when it was at 65% (indicated) and hopping in the shower and came back about 20 minutes later surprised to see it at 100%. Still working off that today about 22 hours later, now listening to music, and it's currently at 76%. From my readings, the phone and charger 'talk' to each other and the choice regarding charge type is automatic. I did note that, the first time I charged the phone from 0% (how received), it did get warm for about 15 minutes. Subsequent charges have found the unit cool to touch. I'll discharge it today and run some temperature and charge tests tonight. That's right, I meant to write "more than 50%". Thanks for the response! Really?! How on earth do u get it to last that long?! I never get more than a days worth of use from a single charge. It also heats up significantly when I'm charging it. Nice way to resurrect a 8 month old thread!
" but it does slow to a normal charge once the battery gets to around 50% in the Turbo charger. I"
Not on mine ... it flies all the way to 100%. Where did you read that ? TJ Kelly Jr likes this. Where did you get that information ? If I use the 'Turbo' charger (not to be confused with the phone name) ... it charges from whatever starting % all the way to 100% ... which I have confirmed by looking at the charging rate in my battery apps. If it didn't, what would be the point of a Turbl charger at all? BTW ... they should have called it Speedo Charger lol. It "turbo" charges until 78%, then does a normal charge after that. Interesting. I will have to double check the rate from 78% on. I'm charging at this moment ... started at 41%. Verizon Motorola Droid Turbo Which is the thinnest, most minimalist case? Why am I having call quality on a certain network only on the Note 4?